Ok, so I’ve been singing the praises of The Raid, sight unseen, since I first saw the trailer back in September and I’ve blogged about it a few times and even have it as one of my most anticipated films of the year. Finally, at long last, the Indonesian action film that wow’d audiences at last year’s Toronto International Film Festival and this year’s Sundance Film Festival makes it’s way to Oahu for it’s theatrical run here in Hawaii. The film opens tomorrow at Consolidated Kahala 8 and Consolidated Ward 16 and here are five good reasons why you should go out and see this movie . . . If you’ve been to the movies at in, oh I don’t know the past three years or so, chances are you’ve been to a movie or two which just seems to be a rehash or retread of a movie you’ve seen before. Don’t get me wrong some of these movies can still be pretty good and I like a good franchise as much as the next guy, but where’s the originality these days? You don’t see Hollywood taking a lot of chances on things that are new and original. Well, The Raid brings something fresh and original to the table not having been a former TV show, book, comic book, or movie. And you won’t need special glasses to watch this movie either. Director Gareth Evans was introduced the Indonesian martial arts of Pencak Silat while filming a documentary on the subject. Wanting to bring more attention to Pencak Silat, Evans features the fighting style prominently in his second film Merantau, and here again in his third film The Raid. An umbrella and unifying term for similar martial arts throughout Indonesia, according to Wikipedia “pencak and silat are seen as being two aspects of the same practice. Pencak is the performance aspects of the martial art, while silat is the essence of the fighting and self-defense.” Throw in the use of weaponry to Pencak Silat and it is a force to be reckoned with. Here’s to hoping that The Raid does for Pencak Silat what Ip Man did for Wing Chun. From gun battles to fights with knives, spears, machetes and more the amount of coordiation put into the fight sequences looks amazing. But don’t just take my word for it, check out the four-on-one battle in a scene from The Raid (above). I’m not going to stereotype any of you who may be reading this out there, but there are those that are daunted or just plain turned off by seeing foreign films. Yeah sure the subtitling I know is a part of it, but I also think that some people feel that they just won’t “get” foreign films. Now is the time to start changing that mentality. As I’ve mentioned previously, The Raid is an Indonesian film so you will have to do some reading along with your watching, but I guarantee that you will “get” this movie and have a fun time doing so. The film is about a SWAT team taking down a crime lord and his minions–nuff said. Also, you can brag about seeing a foreign film the next time you’re talking with friends around the water cooler. Hyperbole? Maybe. From everything I’ve seen and from reviews that I’ve read, all signs point to The Raid delivering on the action showcased in the trailer. 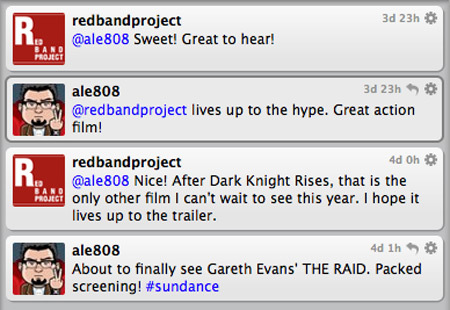 We even got a confirmation from HIFF programming director Anderson Le after he saw the film in January at Sundance. I’ve also heard that the action ramps up as the movie goes on. Looking back on what originally excited me about this film, it definitely had to be the insane depiction of the action of the movie and the seemingly large amount of it. In a way I guess it gives off that vibe that you get from seeing 80s action movies like Die Hard, you know, when action in movies seemed more real, weren’t that effects heavy, and were taken more seriously. That’s what I hope to get from seeing The Raid this weekend, and I hope this post gets you excited for it as well. Does this post convince you to go out and see The Raid? If you do check it out this weekend, but sure to leave us your thoughts in the comments and let us know if it lives up to and deserves the hype.